Flocking the pool is essentially the introduction of a certain chemical compound that binds with floating debris in pool water. This debris literally clouds up the water and can be anything from algae to dirt or any number of minute particles that are not captured by the filtering system. 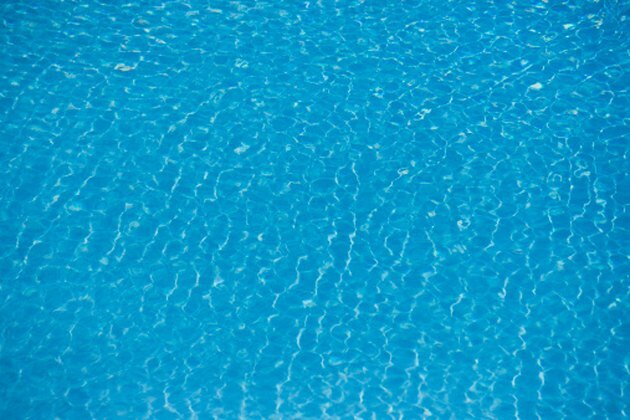 Although a chlorine shock treatment will also cure many types of cloudy water, flocking a pool is less caustic and a less expensive alternative that won't upset the pH water balance, yet will achieve the same results. Flock the pool for crystal clear water. Acquire a container of pool flocking chemical. These are available at pool and spa supply stores or online. Add the flocking chemical to your pool water. Manufacturers recommendations about dosage will vary, but expect to add about 8 ounces of flocking chemical per 10,000 gallons of pool water. Allow the flocking chemical to bind the particles that are suspended in the water. Once bound, they will sink to the bottom of the pool. This action may take between 24 and 36 hours depending upon the amount of chemical used and how bad the water was clouded. Vacuum the pool when all of the particles have sunk to the bottom. A good sign will be when the water itself has become crystal clear once again. How Long Can Water Stay in a Kiddie Pool? How Long to Vacuum a Pool After Shocking?